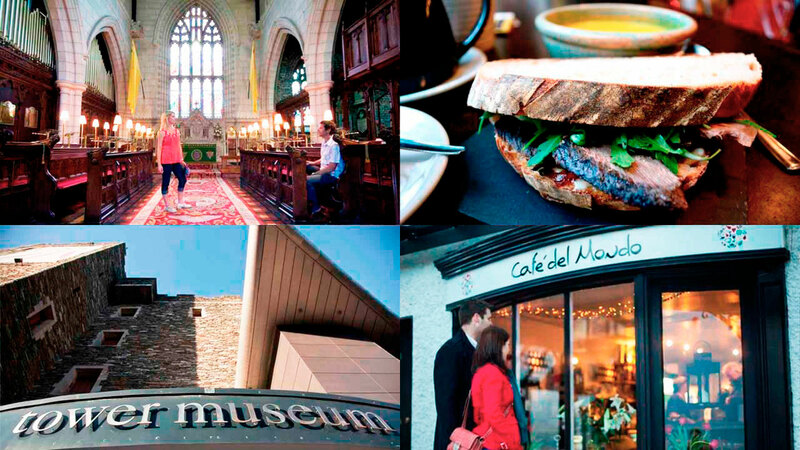 Winding walls, compact character, fabulous food and history to get your teeth into. Meet a legenDerry city. 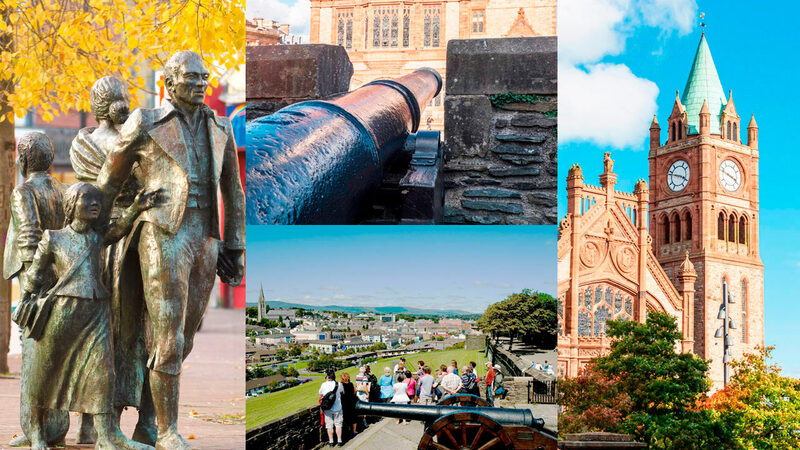 Some advice: don’t just visit Derry~Londonderry. Live it. Don’t rush the walls, stroll them. 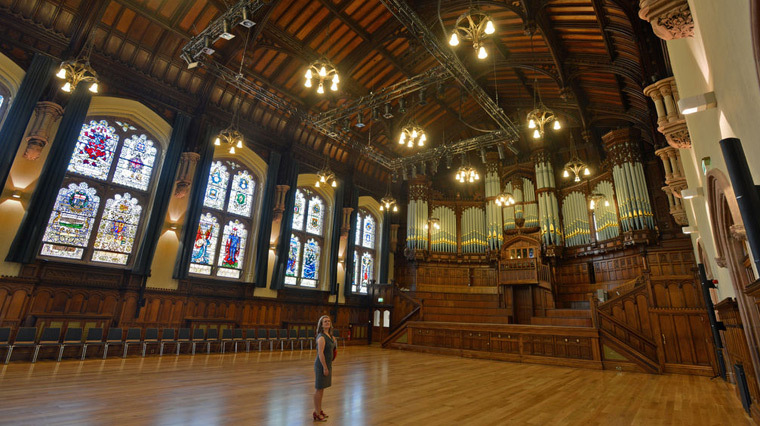 Don’t scan the Guildhall, drink it in. First time here? 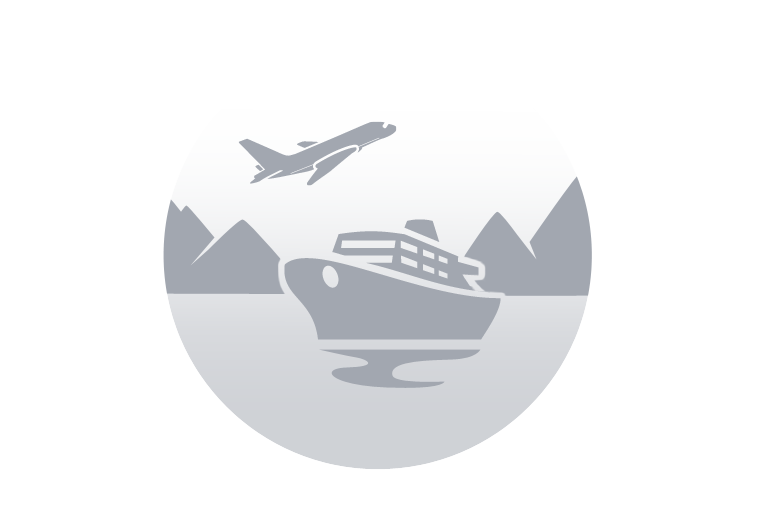 Take a tour and meet the locals. Hear the Foyle River thunder under the Peace Bridge, drool over hot-buttered soda farls in your new favorite café, and follow your ear to best traditional music session in town. Don’t stand on the sidelines in the Walled City. Be part of it. You’ll be glad you did. Curious when these stone wonders were built? You may not believe it to look at them, but building began 401 years ago, back when King James I required defenses to keep the newly planted population safe from Irish rebels besieging the city. At 1.5 kilometers (0.9 miles) in circumference and varying thicknesses of between 3.5-10 metres (11 ½ -33 foot), they did their job. In fact, Derry~Londonderry’s walls have never been breached. And the price to build such handsome, efficient walls? £10,757 ($16,912). A bargain. There are seven gates (entrances) to the walled city. First up, the originals: Shipquay Gate (originally the main point of entry from the River Foyle); Bishop’s Gate (sculpted heads represent the Foyle and Boyne rivers); Butcher Gate (the animal market was once located right outside this entrance); and Ferryquay Gate, (overlooked the ferry quay on the River Foyle). Castle Gate, New Gate and Magazine Gate were added between 1790 and 1888. Considering the troublesome history of the walls, it’s no surprise they’re dotted with a cannon or two. 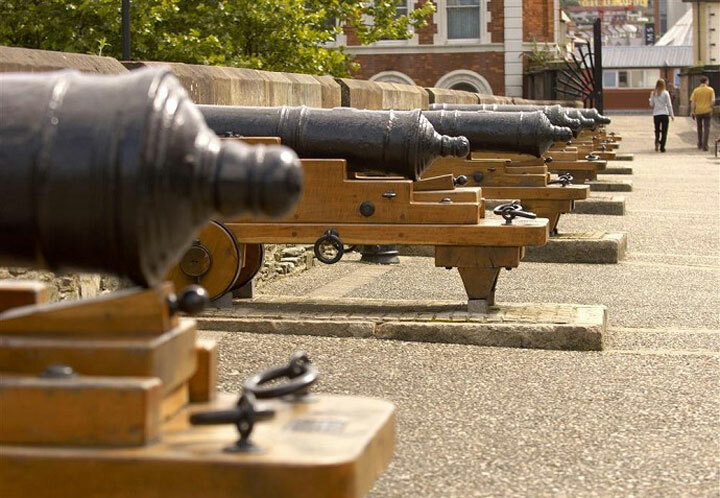 Icons of more turbulent times (two particular sieges in the 17th century saw these weapons smoke and thunder over the Foyle), the 24 cannons got a makeover in 2005 when they were waxed, sponged and repainted. They even had their barrels cleaned. Roaring Meg, located on the double bastion, remains the superstar. Sitting pretty within reach of the walls, this auburn-brick beauty is the anchor for the buzzing Guildhall Square. Arguably the hall’s most arresting feature is its collection of stunning stained-glass windows. Donated by London Companies, they represent everything from fishmongers to musicians. Recognize the Guildhall Clock? It was modelled on Big Ben. A new exhibition here explaining the city’s plantation provides a keyhole view into Derry~Londonderry’s curious and complex past. Belfast isn't the only city with murals. 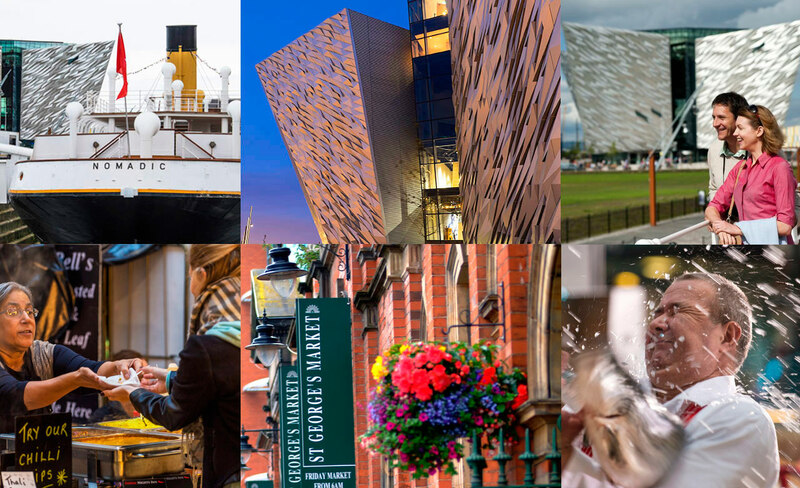 The Walled City could easily match Titanic's hometown for impactful modern art messages. 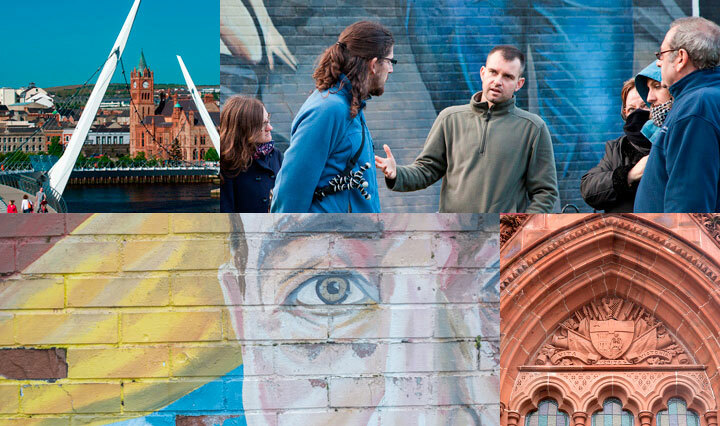 To get the real story behind these colorful and complex artworks hop on a tour run by the Bogside Artists. These are the local artists behind many of the murals and few can elaborate on their significance with more insight or understanding. Another noted name on the Derry~Londonderry tour menu was the late and very well-respected Martin McCrossan. You name them, Martin has charmed them. A city native with an encyclopedic knowledge of the city, Martin counted the likes of Will Ferrell, Susan Boyle and Martin Luther King III among his guests. Mere steps from the Guildhall and the city walls, this river-spanning beauty is a visual treat. 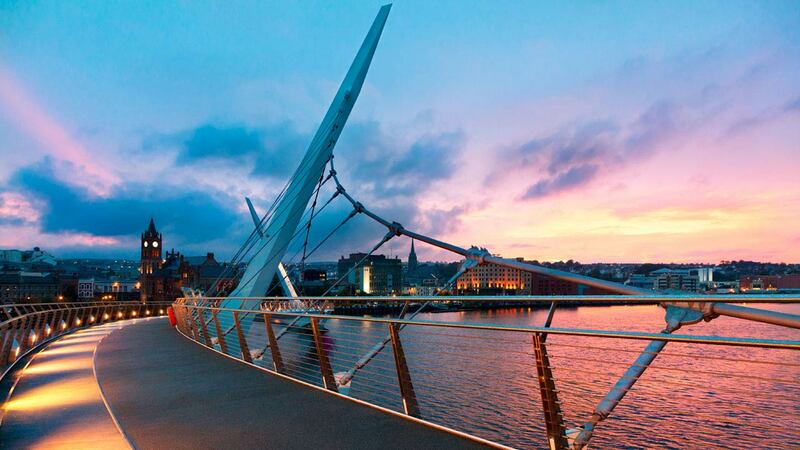 Introduced to the city in 2011, the elegant, snaking curves of its design have seen the Peace Bridge become a Derry-Londonderry icon, and a scenic spot from which to watch the majestic Foyle rush towards a meeting with the eponymous Lough Foyle to the north. Café Del Mondo, Shipquay Street: nice location in the Craft Village. Cozy interior + rugged, tasty food = winner. Legenderry Warehouse No.1, Guildhall Street: great coffee, sinful pastries and a relaxed atmosphere. Beech Hill Country House Hotel, Ardmore Road: sumptuous food and elegant surrounds. Perfect for a long lunches. 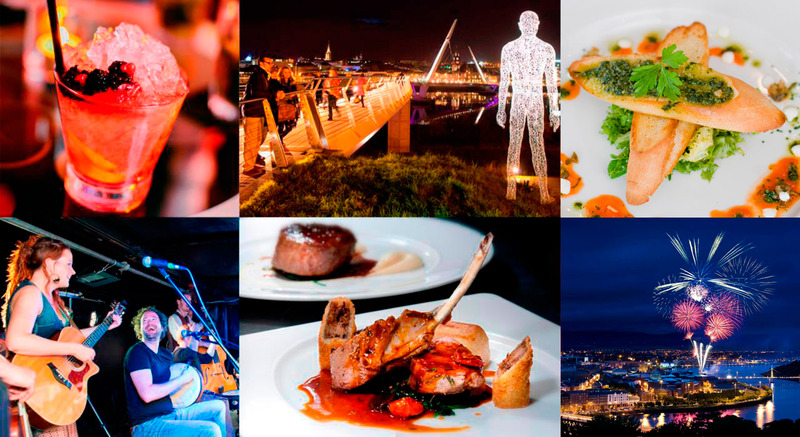 Ebrington Square: once a military barracks, today boasts a Zen, modern art feel. A prime picnic spot. 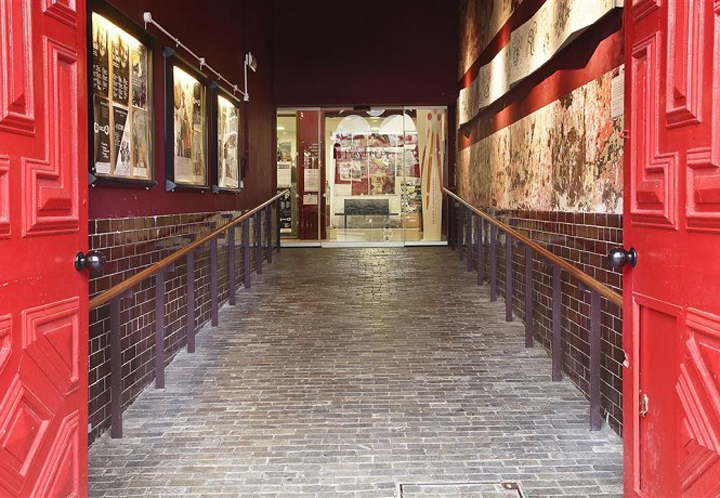 The Tower Museum: stories and artefacts ranging from the Spanish Armada to WWII. A triumph. The Museum of Free Derry: Derry-Londonderry doesn’t hide from its past. Get the inside story here. St Columb’s Cathedral: luxuriant and ingenious architecture, stone, tile and stained glass. Gorgeous. 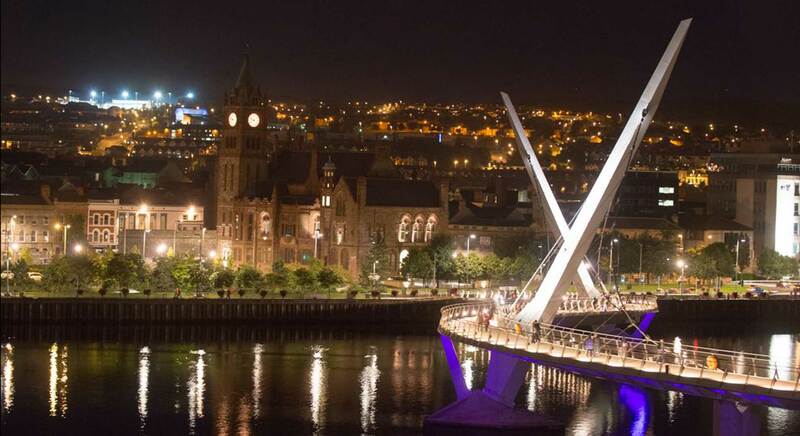 Traditional pubs, culture on tap and elegant eateries: this is Derry~Londonderry after dark. 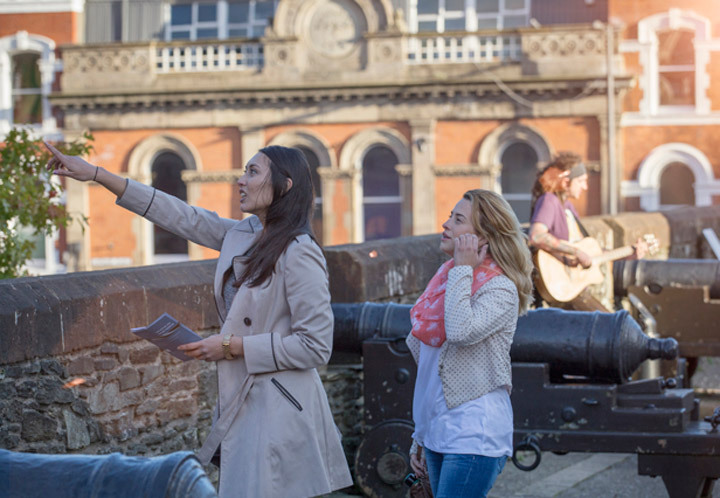 Few were surprised when UK City of Culture made Derry-Londonderry its home in 2013. 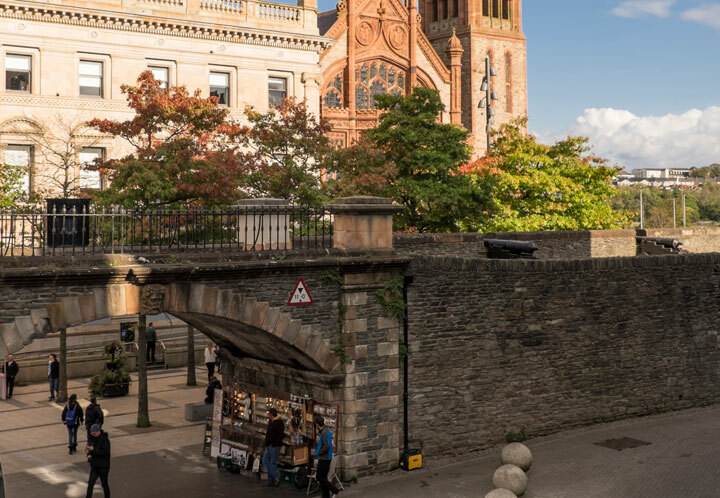 This is a city where spots like Cultúrlann Uí Chanáin (the interior of which was nominated for the prestigious Stirling Prize for Architecture), The Verbal Arts Centre and the Nerve Centre bubble and buzz with the kind of unique spoken word, music, modern art and drama events that define a place and its people. 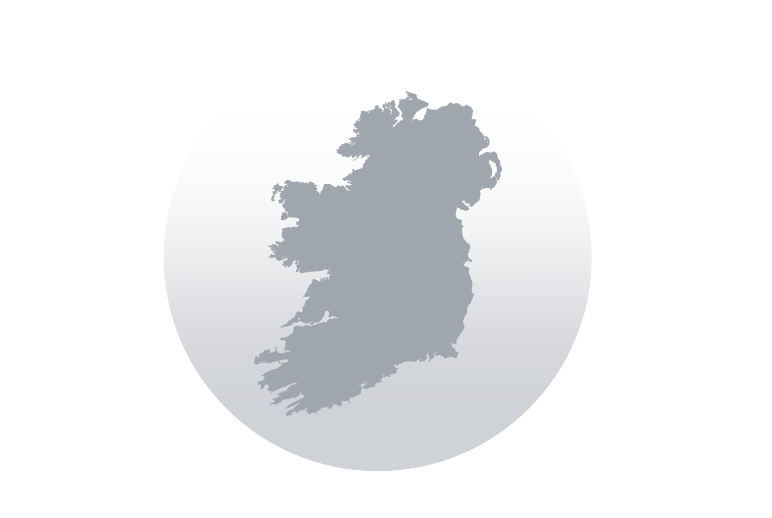 Did you know Ireland is the home of Halloween? It’s true, but back then it was called Samhain (pronounced Sow-win) and there were no toffee apples on the menu. Today, few celebrate fright-night better than Derry~Londonderry. 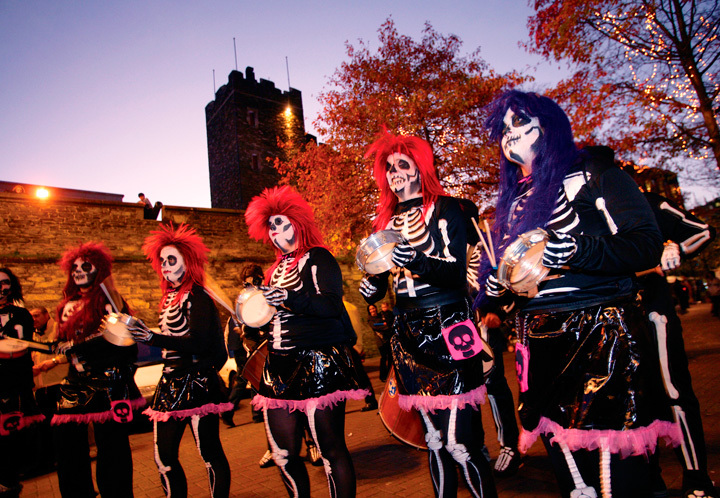 Wrapped up within the ghoulish grasp of the Banks of The Foyle Halloween Carnival are countless events, live music and terrifying characters. Fancy dress optional (but advised!). Described by the people who know it best as a ‘self-help, grass roots, bottom-up-community’ project, The Playhouse is one of a kind. A former school and convent (a ‘friendly ghost’ nun is said to still call the building home), the handsome 19th century pile boasts a 175 seat theatre where the sharp end of cutting edge drama tends to ply its trade. 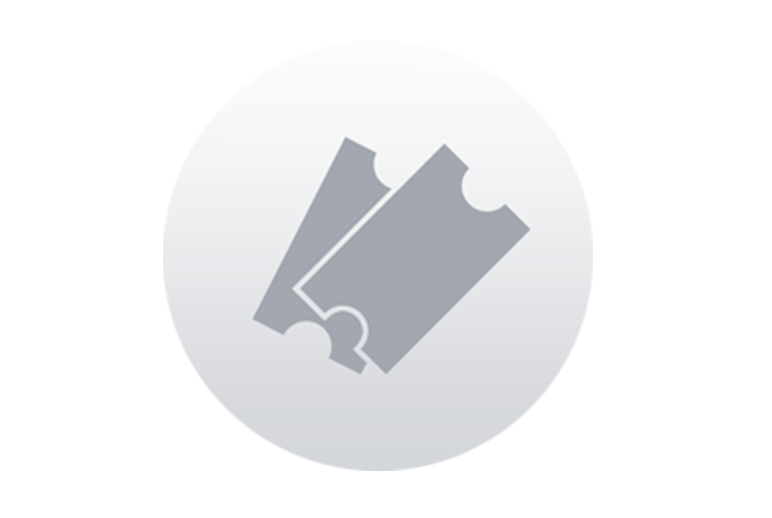 Expect exhibitions, music and comedy as well as plays. Born in Dublin in 1818, the poet and hymn writer Cecil Frances Humphreys (née Alexander) is responsible for some of the most renowned hymns ever written. Author of Once in Royal David’s City and All Things Bright and Beautiful to name but two, Humphreys, in 1850, married William Alexander, an Anglican clergyman who would become Bishop of Derry~Londonderry. 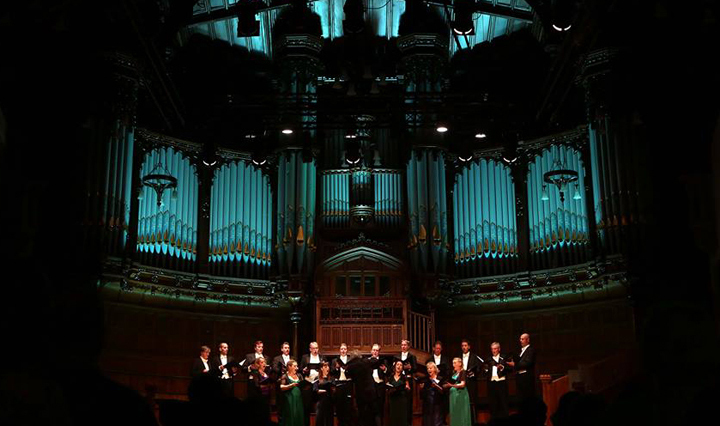 Responsible for various charitable deeds in the county, the spirit of Humphreys’s talents lives on in the rousing, soul-shaking and inspiring 5-day City of Derry International Choral festival, held annually in the city. Meanwhile, a plaque at 25 Bishop Street adorns the three-story red-bricked building (once the Bishop's Palace and now a Freemason's Hall) where the poet and hymn-writer lived with her husband. Custom House, Custom House Street: old-school class and moody lighting. The Lamb Rump with Sweet Potato Purée is pure comfort food. Browns In Town, Strand Road: sister restaurant of Browns on Bond’s Hill, the Portavogie Prawn Ravioli with Curry Foam is a starter from heaven. La Sosta, 45a Carlisle Road: a menu based on freshness and inventiveness. Crispy Duck Confit with Plum Compote = yum. Peadar O’Donnell’s, 59-63 Waterloo Street: THE live music pub in the city. Also home to Derry~Londonderry’s best Guinness? You decide. The Gweedore Bar, 62 Waterloo Street: right next door to Peadar O’Donnell’s this is where nights get late. And good. 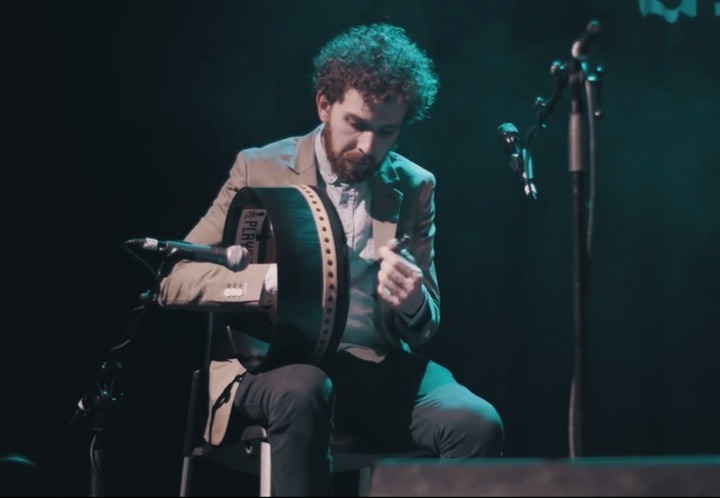 The Grand Central Bar, 27 Strand Road: craft beers, tasty pub grub and Sunday trad sessions. What more could you ask for? The Gainsborough, 5 Shipquay Place: Once a haunt of the city’s dock workers, if you’re looking for an old-school pub experience, this is it. ...Titanic's home town and a self-styled music city undergoing a food revolution. Make the break for Belfast.